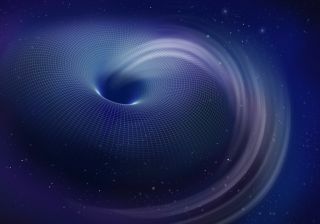 Though wormholes have never been proven to exist, these theoretical passageways through space-time are predicted by Einstein's general theory of relativity. These findings could help scientists explain the universe from its very smallest to its biggest scales. Scientists have long sought to develop a theory that can describe how the cosmos works in its entirety. Currently, researchers have two disparate theories, quantum mechanics and general relativity, which can respectively mostly explain the universe on its tiniest scales and its largest scales. There are currently several competing theories seeking to reconcile the pair. Intriguingly, quantum mechanics also has a phenomenon that can link objects such as electrons regardless of how far apart they are — quantum entanglement. "This is true even when the electrons are light years apart," saidKristan Jensen, a theoretical physicist at Stony Brook University in New York. Einstein derisively called this seemingly impossible connection "spooky action at a distance." However, numerous experiments have proven quantum entanglement is real, and it may serve as the foundation of advanced future technologies, such as incredibly powerful quantum computers and nigh-unhackable quantum encryption. "Entanglement is one of the most bizarre but important features of quantum mechanics," Jensen said. And if entanglement really is connected to wormholes, that could help reconcile quantum mechanics with general relativity, the two examples of this phenomenon, on tiny and huge scales. Recently, theoretical physicists Juan Martín Maldacena at the Institute for Advanced Study in Princeton and Leonard Susskind at Stanford University argued that wormholes are linked with entanglement. Specifically, they suggested that wormholes are each pairs of black holes that are entangled with one another. Entangled black holes could be generated in a number of ways. For instance, a pair of black holes could in principle be made simultaneously, and these would automatically be entangled. Alternatively, radiation given off by a black hole could be captured and then collapsed into a black hole, and the resulting black hole would be entangled with the black hole that supplied the ingredients for it. Maldacena and Susskind not only suggested that wormholes are entangled black holes, but they argued that entanglement in general was linked to wormholes. They conjectured that entangled particles such as electrons and photons were connected by extraordinarily tiny wormholes. At first sight, such a claim might sound preposterous. For instance, entanglement works even when gravity is not known to play a role. Now two independent groups of researchers suggest entanglement may indeed be linked to wormholes. If this connection is true, it could help bridge quantum mechanics with general relativity, potentially helping better understand both. Jensen and his colleague theoretical physicist Andreas Karch at the University of Washington in Seattle investigated how entangled pairs of particles behave in a supersymmetric theory, which suggests that all known subatomic particles have "superpartner" particles not yet observed. The theory was one proposed to help unite quantum mechanics and general relativity. Jensen and Karch found that if one imagined entangled pairs in a universe with four dimensions, they behaved in the same way as wormholes in a universe with an extra fifth dimension. Essentially, they discovered that entanglement and wormholes may be one and the same. "Entangled pairs were the holographic images of a system with a wormhole," Jensen said. Independent research from theoretical physicist Julian Sonner at the Massachusetts Institute of Technology supports this finding. "There are certain things that get a scientist's heart beating faster, and I think this is one of them," Jensen told LiveScience. "One really exciting thing is that maybe, inspired by these results, we can better understand the relation between entanglement and space-time." The scientists detailed their findings in two papers published Nov. 20 in the journal Physical Review Letters.